Standing among the grassy parklands of Bundoora, the fluid architectural design of Parc Vue multi-residential Apartment complex blends the built and natural environments. Using curves to soften the building, and natural timber look panelling that encases the exterior - the structure melds into the surrounding landscape. 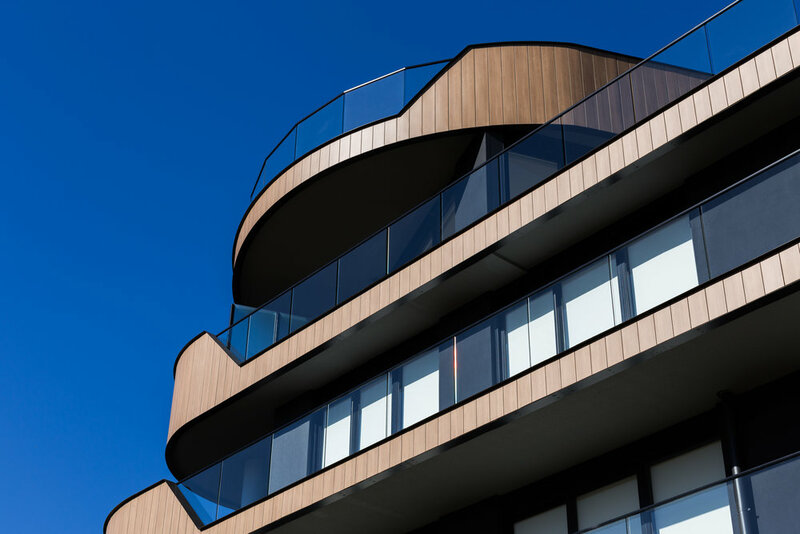 The undulating façade was made possible by Covet’s Ever Art Wood® Express cladding panels. Lightweight and easy install, the panels were pre-fabricated with a 200mm face and 10mm express joint which concealed all fixings, creating a seamless appearance. Sturdy but flexible, they were made to wrap around the building to achieve the architect’s vision. The non combustible, timber look aluminium in Wuoro Nato and Kuri Masame also had a custom texture applied - mimicking the matte tones and texture of real wood. Unlike other timber alternatives, Ever Art Wood® has a photorealistic finish, which lead to its use in the interior of the apartment complex within the lift lobbies. Ever Art Wood® is virtually maintenance free, and unlike real timber, will not warp and fade over time. It is suitable for both external and internal applications.